This entry was posted on September 13, 2010 by . As much as we would all like to have the means and space for a beautifully laid out, custom-made walk-in "closet" about the size of a two-car garage (think?Cher's GIANT computerized closet system in Clueless), the reality is usually way, way less helpful. I've been on the hunt for various shoe storage solutions since I still have about two trash bags full of shoes with nowhere to go in my new place. Here are some of the best I've found for many different options (short of getting fancy built-ins and customs)--hidden or open and/or store-bought or DIY. Let me know what you guys think! In case you're not so handy with power tools and the like, here are some ready-made alternatives to your shoe organizing woes. 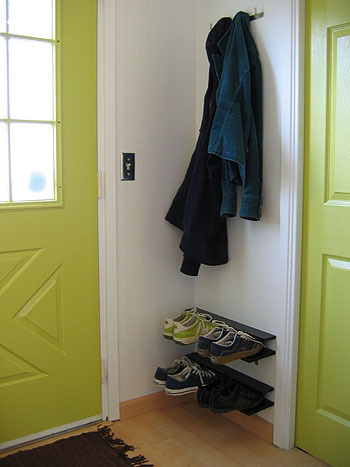 Yeah, about those overdoor shoe organizers... Ok I'll admit, it's still a decent option. As long as you put it on the side of your door that no one sees. This one is also very different from the traditional ones in that it's slimmer and yet holds more shoes! Another great option to consider, multi-use furniture! It's a bench! It also holds shoes! Dress it up enough and you can put it at the foot of your bed and have a sit while you take off your shoes and then, voila, put them away on the bench you're sitting on. Would also work for entryways, etc. There's also a wood (veneer on particleboard) option. I first saw this on Style Bubble and my interest was definitely piqued. I have a closet exactly like that! With an open space about the same size! And I love hamster wheels! But alas, the wheel version seems to only be available in the UK . The half wheel version can be found in Target though. 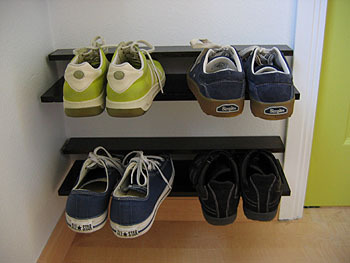 I love this organizing solution that makes your shoes almost seem like they're floating in mid-air! I looooove this way cheaper alternative to the j-me version--and it doesn't look bad either! Also, you can make it pretty much any color you want--even to match your walls. There was a noteworthy suggestion in the comments to line the sides that touch the shoe with felt as to prevent paint transfer on your precious shoes or to keep them from getting scratched. Works for any size space! What a great decorative solution! This one is definitely just for those "so pretty it SHOULD be displayed" heels in your collection. But hey, you can always just chuck your smelly running shoes under your bed or something. For the love of all that is impeccably organized and holy! Wow, I mean, WOW. So this really sweet guy decides to surprise his fiancee with a sweet shoe room in their new house. This was the end result. The best part about this is he got most of the materials from IKEA. Yup, those are those Billy bookcases transformed into a super sweet boot and shoe organizer, complete with accent lights and glass shelves. Have a similar space that you weren't too sure how to utilize? Well here's your answer! 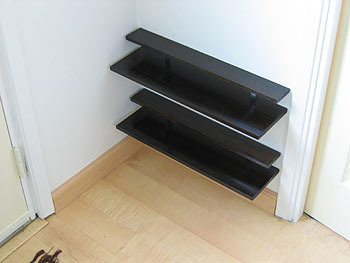 Very cool and easy solution from Jost Litzen, an Apartment Therapy reader. With a little imagination, there can be countless mods to the same principle. Perhaps using an non-functional fireplace opening as a frame? I wish I thought of that for my old apartment in what used to be a 19th-century brownstone mansion.